And as the anger over soaring rents grows, so do the protests: last weekend, 50,000 protesters took part in a march against rent increases in Germany's capital city, which was organized by an affordable housing advocacy group in an effort to collect signatures for a referendum that would push the city to expropriate apartments from large landlords, and transfer some of the city's increasingly expensive residential rental properties to public ownership. 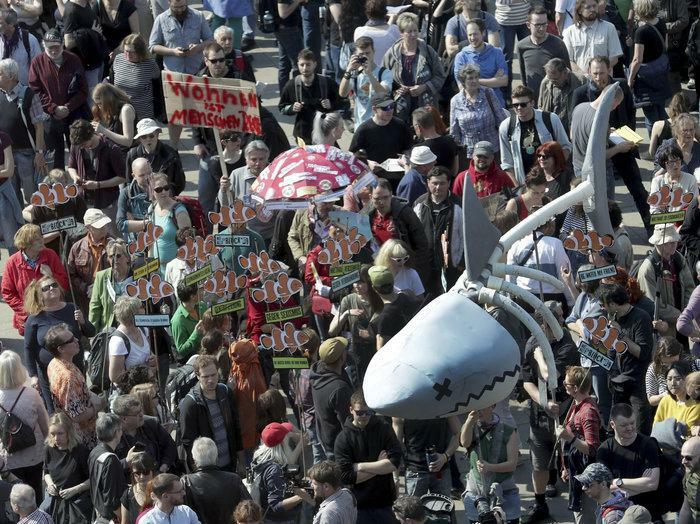 Protestors with a banner reading ’Expropriate Deutsche Wohnen and Co.’ in Berlin on April 6; Getty Images. The proposal targets for-profit companies that own more than 3,000 apartments in Berlin: "These are companies that are coming in and seeing a really profitable market," Thomas McGath, a spokesperson for the group that organized the campaign, told NPR. "It's not your normal mom and pop landlord." 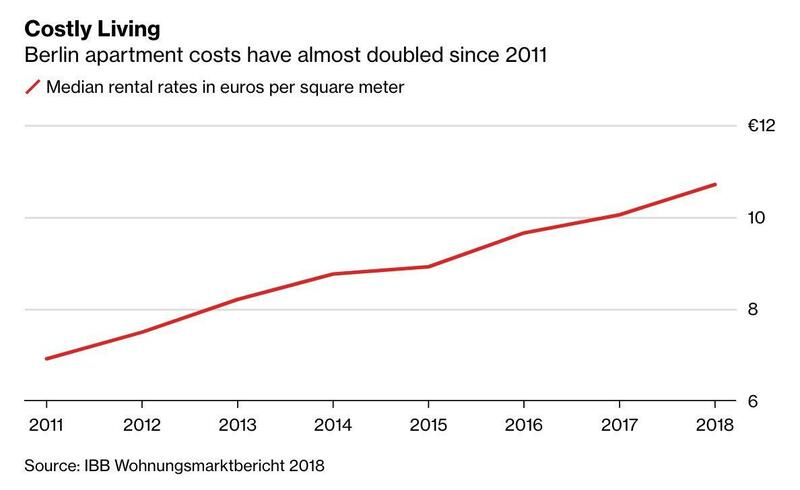 In other words, far from not sparking inflation, the ECB has not only doubled Berlin rents, but sparked a historic backlash that may result in the confiscation and the nationalization of big, corporate chunks of the housing market. And here's where it gets especially troubling for the ECB: under German law, the plan technically could happen. As NPR reports, Article 15 of the German Constitution states that "land, natural resources and means of production may, for the purpose of nationalisation, be transferred to public ownership." Furthermore, while Germany has the lowest proportion of home owners in the European Union, renters are by far in the majority in Berlin. That makes rental costs a political issue. Merkel’s government has taken tentative steps by passing legislation to limit rent increases and pledging to invest more than 6 billion euros in affordable housing. Ah the irony: East Germany, in its passionate desire to "tear down this wall", never really considered the long-term consequences of a free market (even if one manipulated entirely by the ECB), and is suddenly feeling nostaglic for the good, old days of communism, where things such as private property did not exist. 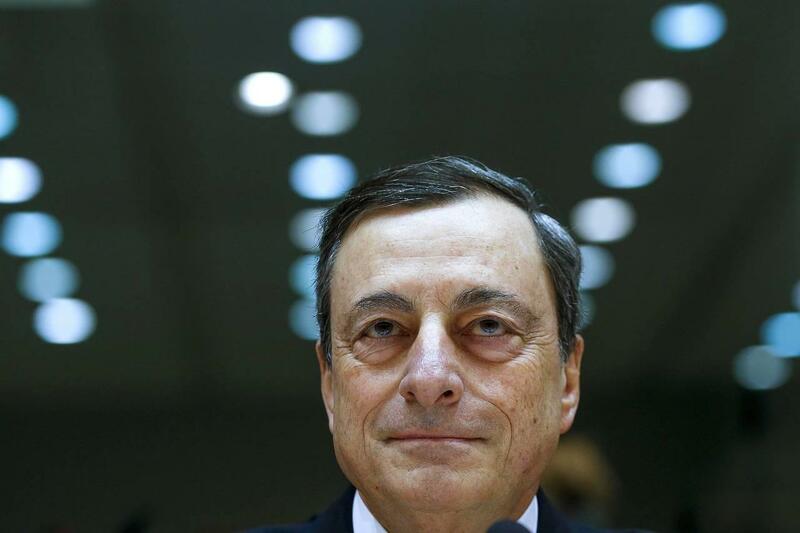 Well, congratulations, Mario Draghi: your monetary policies are about to force the first European nation to revert back to socialism. The girl’s poignant protest highlights the emotionally charged nature of the housing debate in Germany, and Berlin in particular. In the capital city, where residents have been buffeted by a sudden surge in costs, a movement is gaining momentum for a radical solution: nationalizing big chunks of the housing market. Furthermore, unlike any typical, disorganized grassroots movement, this one is very clear in their demands: the organizers have started collecting signatures for a referendum to push the city to expropriate apartments from large landlords - companies that own more than 3,000 units like Deutsche Wohnen SE and Vonovia SE. The final straw for the activists according to Blocame last year, when Deutsche Wohnen agreed to buy 800 residential and commercial units on Karl Marx Allee, an imposing Stalinist boulevard in the former communist east. Residents fearing rent increases mobilized, and the city sought to block the deal in court. Naturally, the property company - one of the main winners of Berlin’s housing boom - has rejected demands to turn over its property. “We won’t allow our assets to be expropriated,” Deutsche Wohnen Chief Executive Officer Michael Zahn said during a panel discussion in Berlin this week. “That’s just not going to happen. We’re not living in a banana republic." We wouldn't be so sure: the activists need to collect 20,000 within six months and another 170,000 by February. While pushing the state to buy apartments won’t increase supply, campaigners argue that the measure would send a signal to landlords that they need to play fair or risk losing their assets. Of course, landlords are merely responding to market supply and demand - if rents this high were uneconomical they wouldn't exist. The question is why are such high prices suddenly affordable. For the answer, look to this man, who has injected trillions in both Europe's capital markets and, to a far lesser extent, the economy. The result are rents that are unaffordable for the majority of the population, but since they were never the marginal price setters, well.... take your protest from Berlin to Frankfurt, and ideally inside the lobby of the ECB. So will Berliners be successful in pushing through the first nationalization of property in modern German times? It remains to be seen: if the campaign can pass its first hurdle and collect 20,000 signatures, the city's government will be tasked with drafting a counterproposal that satisfies the grassroots group. If the government fails, the group will need to rally another 170,000 signers to move the proposal to a referendum and then to a ballot, where a majority will be required to pass it. As Bloomberg adds, the chances of the referendum’s success may not be so far-fetched. The German constitution allows for expropriation in the interests of “socialization” in return for adequate compensation. Berlin has a vibrant track record of civic activism, with a 2014 referendum successfully forcing the city to back off plans to sell parts of the former Tempelhof airfield to developers. While most mainstream politicians, including Chancellor Angela Merkel and Berlin’s mayor, are against using taxpayer money to buy apartments, there has been tentative support. Robert Habeck - co-leader of the Greens, the second-strongest party in Germany in recent polls - has said state housing purchases need to be considered to counter speculation. The risk is that such state intervention could scare away investors needed to bolster supply, which is the only real long-term solution. The German construction industry association warned that compensation for expropriated owners could run to 36 billion euros ($41 billion), enough money to build over 220,000 rental units on government land. 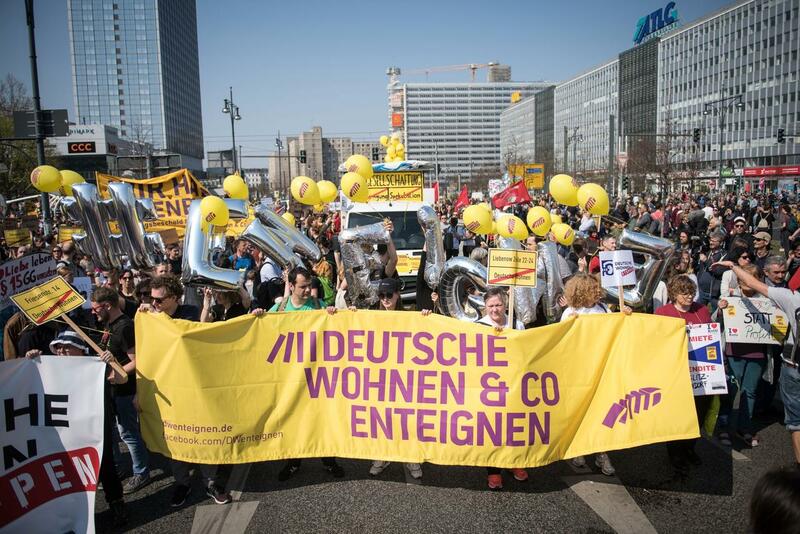 “What we really need to do is build, build and build again,” said Stefan Koerzell, a senior official at the German Trade Union Confederation, which supports the referendum. The growing crisis is a “wake-up call” for politicians, he said at a press conference in Berlin.